Housing unit density can be used to help understand the demographic, cultural, or natural aspects of the region – for instance, to examine whether a particular area is urban or rural, to determine the prevalence of a particular housing type, or to view an area’s terrain or natural landscape. For example, in 2010 Swain and Graham Counties had the Mountain Resources Commission (MRC) region’s lowest housing densities per square mile, which could be related to the available land needed to support housing infrastructure or the prevalence of mobile homes in those counties. Note also that Swain and Graham Counties have some of the lowest populations in the entire MRC region (see Human | Population | Current Population). The change in housing units shows the increase or decrease of all housing units in an area over a period of time, and can be used to measure the growth (or decline) experienced in that area. Additionally, a look into the type of homes that experience growth or decline can indicate how an area is changing. An increase in single-family homes, for example, can indicate growth into areas that can accommodate the space needed for individual home developments, possibly outside a community center. In contrast, an increase in apartments or other multi-unit structures may indicate a more dense pattern of growth, perhaps within or near a community center. In the Mountain Resources Commission (MRC) region, each of the 27 counties experienced a positive percentage increase of homes between 2000 and 2010. Watauga, Jackson, and Cherokee Counties had the highest percent of increase, at 38.8, 34.5, and 30.8 percent, respectively, and Cleveland, Surry, and Madison Counties saw the lowest increases, at 7.6, 8.5, and 9.1 percent, respectively. 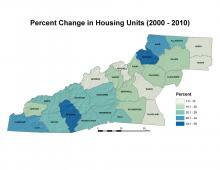 The large housing unit increases in Jackson and Watauga Counties could be related to the universities located in those counties – Western Carolina University in Jackson County and Appalachian State University in Watauga County – and growth in their student populations. If this is the case, the expectation would be to see increases in apartments and other multi-unit housing types along with increases in single-family homes. However, the data does not support this expectation, as the type of housing structure for these counties – and for the entirety of the MRC region – has experienced very little change in the distribution of housing types over the last decade. Another explanation might be found in the fact that both Jackson and Watauga Counties have experienced a significant increase in population during the last decade, at 21.6 and 19.6 percent, respectively. In comparison, the entire MRC region saw a 9.8 percent population increase during the same period. 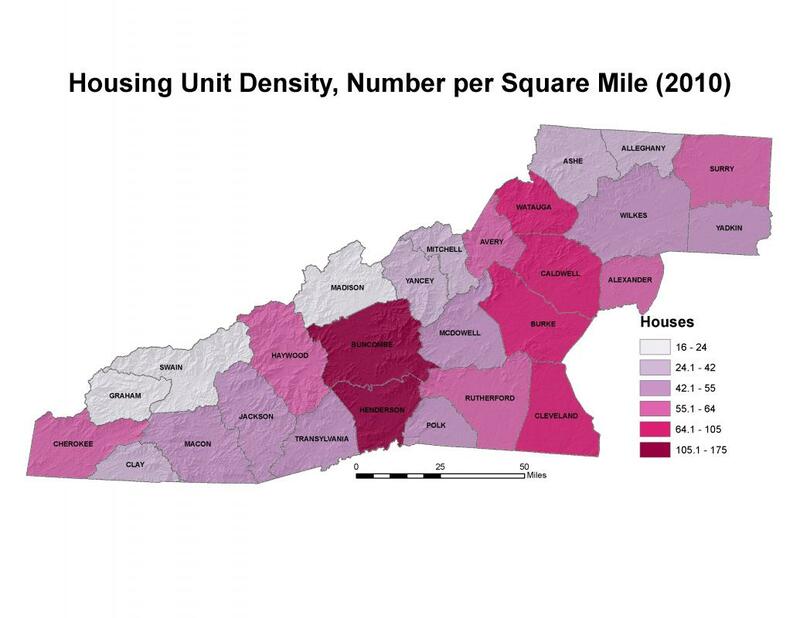 The high rate of population growth in Jackson and Watauga Counties could account for the increase in overall housing unit structures, while maintaining the same housing type distribution. U.S. Department of Commerce, United States Census Bureau. Census of Population and Housing, 2010. Accessed from: http://www.census.gov/prod/www/decennial.html.